Shirts With Random Triangles: James Franklin declares Maryland and New Jersey are Penn State territories. 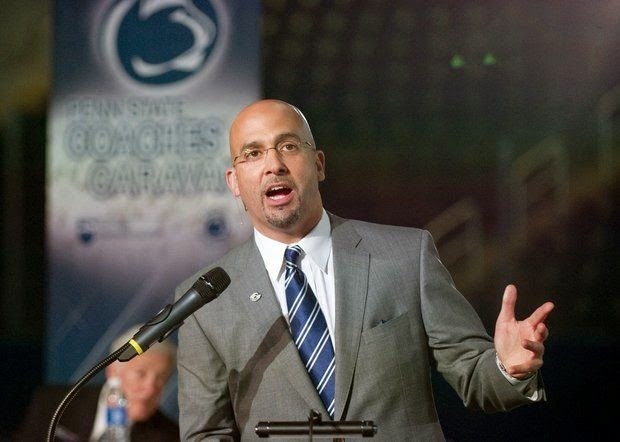 James Franklin declares Maryland and New Jersey are Penn State territories. James Franklin is apparently a graduate of the Vlad Putin School of Geopolitics' sports management program. Speaking at a stop of the 2014 Penn State Coaches Caravan in Baltimore, the first year Nittany Lions head coach explained why the addition of Maryland and Rutgers to the Big Ten will not alter his recruiting strategy in Maryland or New Jersey. "I consider this (Maryland) in-state. I consider New Jersey in-state," Franklin said, according to The Baltimore Sun. Of the schools in those areas, he said, "might as well shut them down because they don't have a chance." Penn State goes on the road to face Rutgers on Sept. 13, and hosts Maryland on Nov. 1.